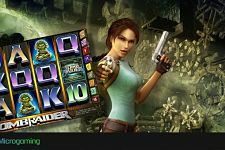 "Follow Lara Croft in her adventures to help her find a diamond and she will help you obtain some massive payouts in the Tomb Raider slot." 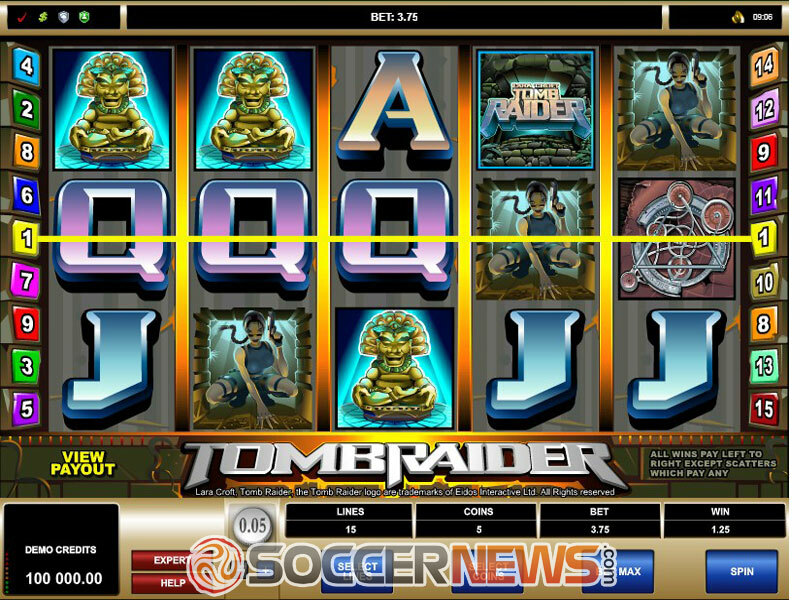 Tomb Raider is the world's first branded slot created under an exclusive deal between Microgaming and Eidos. The Tomb Raider brand was already popular in 2004 when the game was launched thanks to the video game and blockbuster starring Angelina Jolie, which served as inspiration for the video slot. At the time of its launch, the Tomb Raider was a huge hit and it remained popular among gamblers for over a decade. One of the main reasons for the game's popularity is its polished appearance. 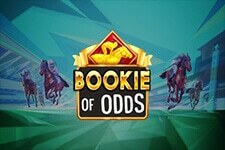 Besides, the slot comes equipped with a free spins feature awarding tripled payouts and a bonus round awarding up to 2,500 coins while the maximum payout stands at 562,500 coins. 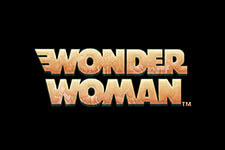 The reels are home to three theme-related regular symbols including squatting Lara Croft, the crouching tiger and the cracked circuit while the rest of positions are covered by generic playing card icons designed to match the logo of the game. The Tomb Raider logo stands for Wild, Lara Croft assumes the role of Scatter while the idol represents the Bonus symbol responsible for triggering the Tomb Bonus feature. 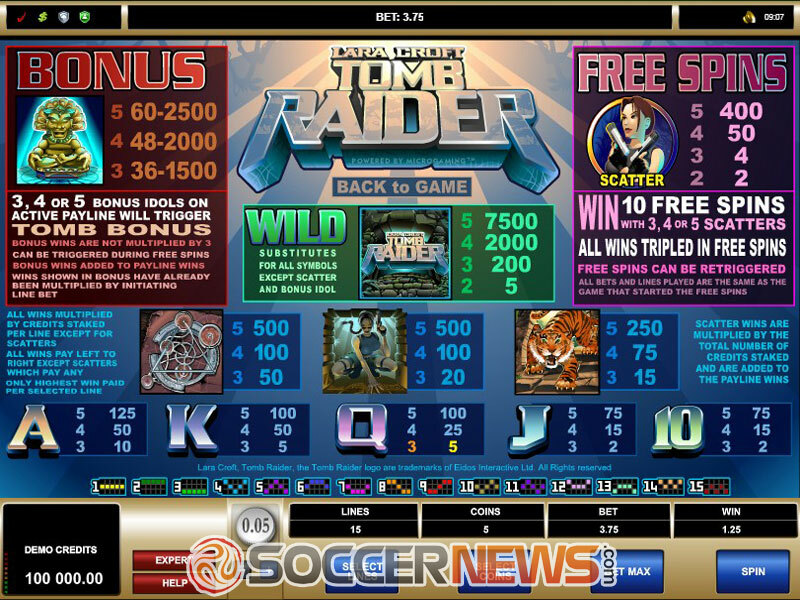 The game uses a standard 5x3 layout with 15 adjustable paylines. Player can wager up to 5 coins per line at a coin denomination ranging between $0.05 and $5. 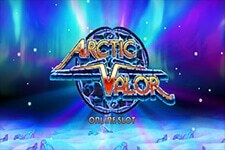 With a betting range between $0.75 and $375 at all the paylines active, the slot machine is a perfect fit for both casual and seasoned players. To win a prize you need to land 2 or 3 matching symbols in a row on an active payline starting from the far left. Tomb Raider Wild will replace all regular symbols to help you complete more winning combinations. This special symbol also pays in its own right and it is the top paying symbol in the game awarding 7,500 coins for a five of a kind combination. Lara Croft Scatter triggers the free spins feature when 3 or more of these hit the reels at the same time. 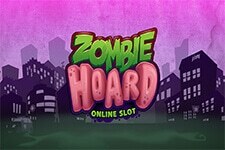 You will get 10 free games with all payouts obtained from them tripled. Landing 5 Scatters anywhere in view pays 400x your bet. Last but not least, placing 3, 4 or 5 Bonus symbols on an active payline triggers the Tomb Bonus round. 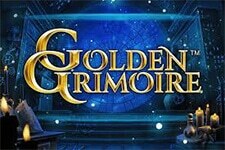 You will be offered to pick 3 out of 12 idols to reveal prizes. The bonus round can award from 36 up to 2,500 coins depending on the number of triggering symbols. 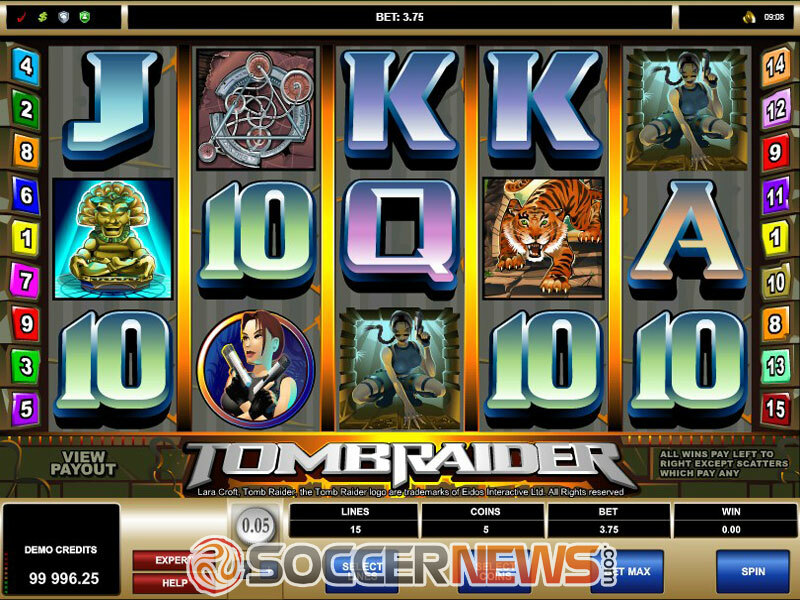 Visit any of Microgaming-powered online casinos and find The Tomb Raider. "Though its graphics and sounds may seem a bit dated today, Tomb Raider can still provide you with an exciting gaming experience. If you are a true adventurer, join Lara Croft and enter the dark vault for a chance of hitting some hefty wins. 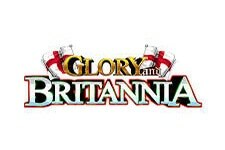 Throughout the game, the bonus features will boost your winning chances and help you win bigger payouts."